If you want to fuse a savory flavor with a taste of freshness in a single serve for your diners, this menu from Knorr World Cuisine is undeniably the right choice. 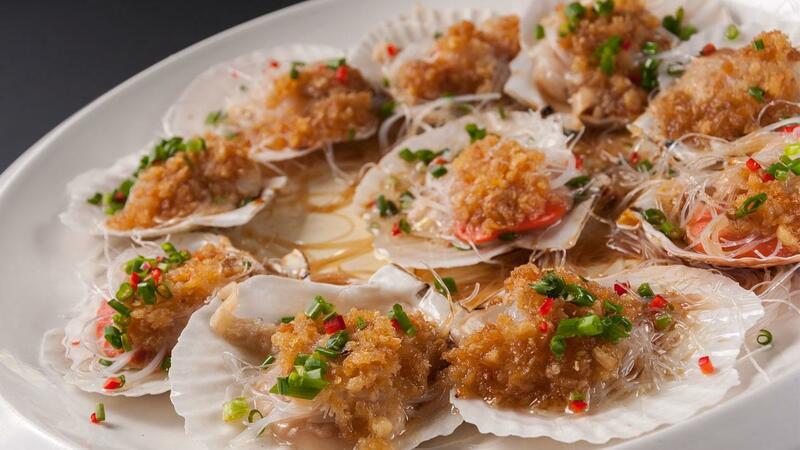 The perfect blend of steamed scallops and garlic stir-fry will leave a tickle on tongue! Remove scallop meat from the shell. Rinse the meat thoroughly and remove any dirty bits. Scald the scallop shells in hot water for a few minutes. Discard hot water and rinse the shells. Return scallop meat to the shell. Twirl a small amount of softened vermicelli around a pair of chopsticks and place them in the centre of a scallop shell. Add scallop meat on top of vermicelli. Heat oil in pan and sauté ginger until aromatic. Add garlic and chopped spring onions. At the first sight of the garlic changing to light golden brown, turn off the flame. The garlic will continue cooking in the hot oil. Add soy sauce, Shaoxing wine, white pepper, black pepper, and Knorr Chicken Powder. Stir to combine well. Divide and spoon the topping mixture over the scallops. Steam at high heat for about 4 minutes, or until the scallops are opaque. 3 mins Garnish with sliced chilli and scallions.